Looking for a way to streamline communications with job candidates? Texting may be your answer. According to CTIA.org, job candidates respond to text messages in an average of just 90 seconds. This is compared to an average response time of 90 minutes for email. Plus, when candidates receive texts, as many as 90% of them read them, and a third of them respond. Email doesn’t even compare to these numbers-- only about 18 percent of candidates read emails, and just eight percent respond, according to SHRM. 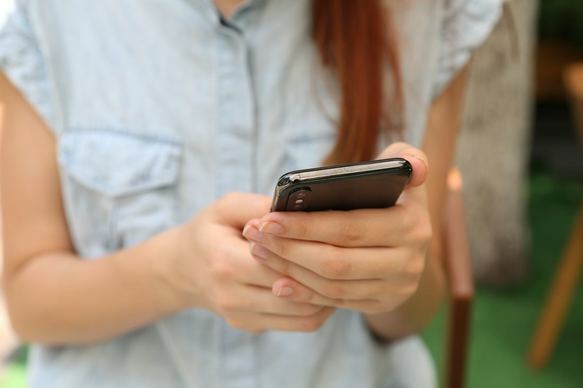 Texting is a powerful tool that can be used incorrectly, so read on for seven things you should know before texting job candidates. 1. Today's candidates actually prefer texting. According to Human Resource Executive, 75 percent of millennials would prefer to talk via text instead of over the phone. As this generation contributes more and more to the workplace, recruiters should meet them where they are to stand out among other companies competing for top talent. 2. Ask candidates to opt in to texting. Although people prefer talking via text, some candidates still feel strange when recruiters text them without permission. During your preliminary interviews, ask candidates how they would prefer to be contacted, and stick with what they ask you to do. The point of opting in and out of any sort of communication format is to make sure that candidates feel that they have options. 3. Texting will reduce time to hire. Since texting will get a response 60x faster response than email, it’s easy to see the obvious reasons your time to hire will decrease as you implement texting. But it will also improve time to hire by giving you the ability to answer and ask quick questions, discussing ideal times for interviews, and providing an easy way to send directions. Texting is also great for time-sensitive steps of the application process such as background screening. Some HCM systems have a background screening text notification system integrated, to simplify the process for recruiters even further. 4. Focus on details and logistics. Texting is ideal for the aforementioned details-- directions, simple follow-up questions, or reminders. However, when you have questions that require more detail on the candidate’s behalf, save them for an interview. And, if you want to hire someone or let them know you’ve selected a different candidate, save that for a phone call or email so that you can be sufficiently clear and courteous. 5. Text during business hours. We all text throughout the day and evening, but texting candidates outside of business hours comes across as invasive and unprofessional. However, once you start to implement texting, candidates will expect a fast response time from you as well. 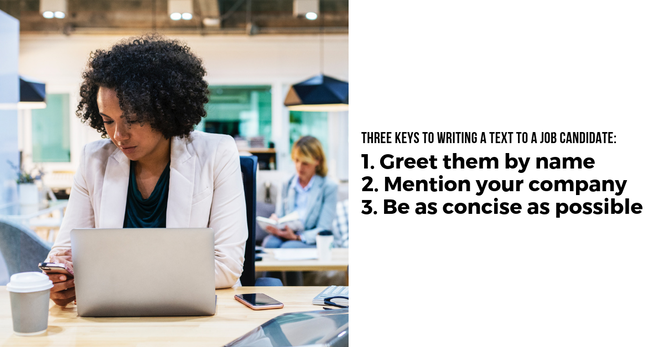 If you receive a text outside of business hours, be sure to either respond with an answer to their question or request, or send a response letting the candidate know that you’ll respond in more depth during business hours. Because texting is such an informal medium, can be difficult to strike the right tone. Email is much too formal and lengthy for texting, but you should avoid any abbreviations or emojis you might usually use in your personal texts. As a general rule, your first text to a candidate should greet them by name. Then, remind them who you are and the company you’re with. Last, ask your question or provide the additional information you need to convey. Then leave it at that. 7. Keep a record and use analytics. Many recruiters are using their personal phones to text candidates. While this helps with response time and flexibility, it leads to a lack of consistency and transparency. 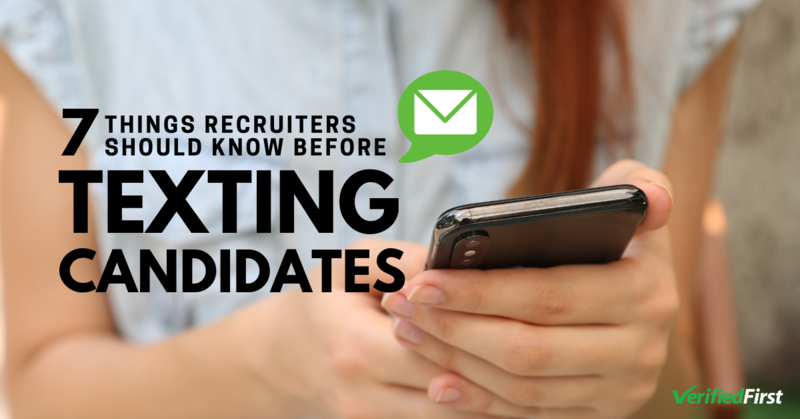 Recruiters should be able to see how frequently candidates are receiving messages, and they should know the conversion rate of candidates to new hires based on texting. Tracking these metrics is important to building an ongoing text strategy. When time is of the essence, texting is by-far the most optimal method of communication. Whether you're sending an interview reminder or requesting a signature on an important document, texting job candidates over emailing them can greatly streamline your response time.